Storey Publishing, LLC, 9781580173704, 496pp. Enjoy the pleasures of growing your own delicious organic food. This plant-by-plant guide includes profiles of more than 765 tasty varieties of vegetables, herbs, fruits, and nuts. 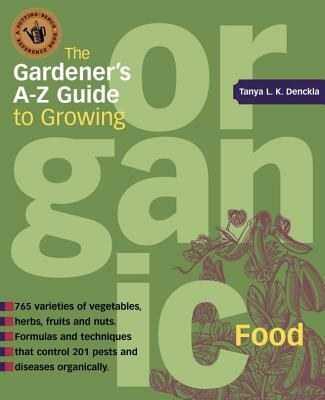 In addition to expert advice on selecting suitable plants and growing, harvesting, and storing them, this invaluable resource includes more than 100 tried-and-true organic remedies that fight off diseases and pests. Get out in your vegetable garden and discover how easy and fun it is to grow your own healthy food. Tanya Denckla Cobb is a writer, a professional environmental mediator at the Institute for Environmental Negotiation, and a teacher of food system planning at the University of Virginia. She is passionate about bringing people together to find common ground and create solutions for mutual gain. She co-founded a community forestry nonprofit organization, served as Executive Director of the Virginia Urban Forest Council, and facilitated the birth of the Virginia Natural Resources Leadership Institute and the Virginia Food System Council. At home, she enjoys the restorative energy of gardening and cooking from her garden. She lives in Virginia and is the author of Reclaiming Our Food and The Gardener’s A-Z Guide to Growing Organic Food. "A great gift for any vegetable gardener who prefers Earth-friendly methods."